Countless white pills as small as peas appeared in Xiao YiShu’s hands. He then waved his hands, and those pills were flashily thrown to each one standing on the square, floating in front of these people, which looked just like countless white lights. Apparently, Jiang Yun’s different performances had drawn Xiao YiShu’s attention. He deliberately asked Jiang Yun to be the last one to be tested in case any other accidents happened. Jiang Yun had no disagreement about it. He nodded calmly. While he noticed that Xiao YiShu frowned slightly and showed a strange expression when Xiao YiShu saw the young man beside him. People though still didn’t understand, they were used to Xiao YiShu’s concise words and dared not to ask more. They took those medicines which were floating in front of them and swallowed in succession quickly. 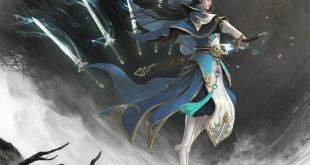 Only a few minutes later, people saw Huo Yuan opening his mouth suddenly, and with a sound, he blew out a puff of milky gas, which was about a finger’s length. Watching this, nobody wasn’t envious of Huo Yuan, even Tang Yi who really disliked him. Because Huo Yuan was the only one who had successfully passed all the three tests so far. Obviously, he would be an inner disciple soon. He had passed a competitive examination, just like a fish leaping over the dragon gate! After Huo Yuan’s performance, more and more people puffed the Tao gas. But no matter how long or how thick, they could only puff one stream of gas from one of their nine orifices. The third test was about to be finished. Right at that moment, people were hearing two light sounds. They then found that a girl about sixteen or seventeen was puffing two streams of milky gas from her eyes, in a length of around thirty centimeters. These two streams of gas were circling around the sky, lingering in the air long before fading. Though most of the people didn’t understand, Xiao YiShu and other disciples were surprised, even people inside the five peaks couldn’t help exclaiming. “Just the same as the Heart of Tao, everyone and everything in this world has the Physique of Tao. But mostly their Tao Physiques are blocked. Only a few people’s Tao Physique can be born to be unblocked through the nine orifices. And if one orifice is unobstructed, it means that this body is of One-Free Tao Physique; two means Two-Free Tao Physique. The third test ended when this young man finished his words. Also, the Seeking-Tao Sect’s recruitment which was held every three years almost ended now. Finally, only two, Huo Yuan and that guy in black, had passed all the three tests. The number of people who had passed two tests was ten, including Tang Yi and that girl of Two-Free Tao Physique. As for the amount of passing one test, it has been up to four hundred people, including the youngest girl Jiang Yun had noticed before. However, all the people weren’t about to leave right now. Because Jiang Yun hadn’t been tested yet. Now all of them were looking at Jiang Yun. They expected to see something unusual happened to Jiang Yun again. Xiao YiShu said nothing but threw a Medicinal Tao Physique Pill to Jiang Yun. The Medicinal Tao Physique Pill was floating in the front of Jiang Yun. Jiang Yun only hesitated for a second, then he caught this pill and swallowed it. Jiang Yun could feel it clearly that the pill once went into his mouth, it became countless streams of milky gas and rushed to his nine orifices and every pore. This pretty surprised him. Would he be the one who was of the Innate Tao Physique? However, when these milky gases reached Jiang Yun’s nine orifices and pores, the hundreds of scars on his body trembled secretly. After that, all these milky gases vanished in a flash, as if they had never existed. Even Jiang Yun wasn’t aware of the scars’ trembling, not to mention others who had paid attention to Jiang Yun. Hence, in the view of them, though Jiang Yun didn’t show any difference and abnormality this time, Jiang Yun still lost the test. Jiang Yun smiled bitterly. He knew that he didn’t pass any test, and thus he had thoroughly lost the qualification to join the Seeking-Tao Sect. Shaking his head, Jiang Yun bade the young man beside him farewell softly. Then he turned to the gate of the Seeking-Tao Sect. Since he had lost the qualification, it was unnecessary for him to stay here. Jiang Yun stopped his step. A second later, he turned around and gave Huo Yuan a cold glance. He had nothing against Huo Yuan, but Huo Yuan humiliated him again and again. Thus, Jiang Yun was considering whether he should do something to give Huo Yuan a lesson. Jiang Yun’s glance made Huo Yuan feel that his whole body was cold. Suddenly, fear arose from the bottom of his heart. He felt that it seemed not to be the wild man who he had despised before that was watching at him, but a primitive fierce beast that could tear him to pieces at all times! Jiang Yun took back his eyes at the end. He again turned towards the gate. Because he was too downhearted to take Huo Yuan as a matter. Not until Jiang Yun took back his eyes that Huo Yuan felt that he had been in a cold sweat. His back had been wetted. Though he had no idea that how come Jiang Yun could have so terrible sights, that short moment had already made him decide to kill Jiang Yun later.